Example of Louisiana Voodoo altar inside a temple in New Orleans. For African-American religion in the United States, see Religion in Black America. Afro-American religions involve veneration of the dead, and include a creator deity along with a pantheon of divine spirits such as the Orisha, Loa, Nkisi, and Alusi, among others. In addition to the religious syncretism of these various African traditions, many also incorporate elements of Folk Catholicism, Native American religion, Spiritism, Spiritualism and European folklore. Abakuá Cuba Ekpe United States Secret society of the Anaang, Efik, Ibibio, Ekoi, and Igbo peoples. 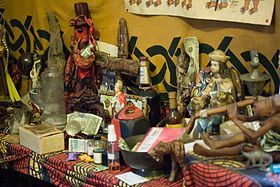 Obeah Jamaica Akan religion, Odinani, Yoruba religion Jamaica, Barbados, Belize, Dominica, Grenada, Guyana, Suriname, Trinidad and Tobago, Virgin Islands, United States, Canada, United Kingdom, Australia Similar to Hoodoo folk magic. Derives from the Igbo obia (or dibia, "doctoring") traditions. Quimbois (African folk beliefs mixed with Christianity, from Martinique). ^ For an extended discussion on Palo's history, see: Dodson, Jualynne E. (2008). Sacred spaces and Religious Traditions in Oriente Cuba. UNM Press. ^ Eltis, David; Richardson, David (1997). Routes to slavery: direction, ethnicity, and mortality in the transatlantic slave trade. Routledge. p. 88. ISBN 0-7146-4820-5. ^ Houk, James (1995). Spirits, Blood, and Drums: The Orisha Religion in Trinidad. Temple University Press.